Cyclodextrins bridged with an ammonium linker which bears a hydrophobic substituent efficiently form supramolecular polymers, avoiding the competing self-inclusion and head-to-head processes. 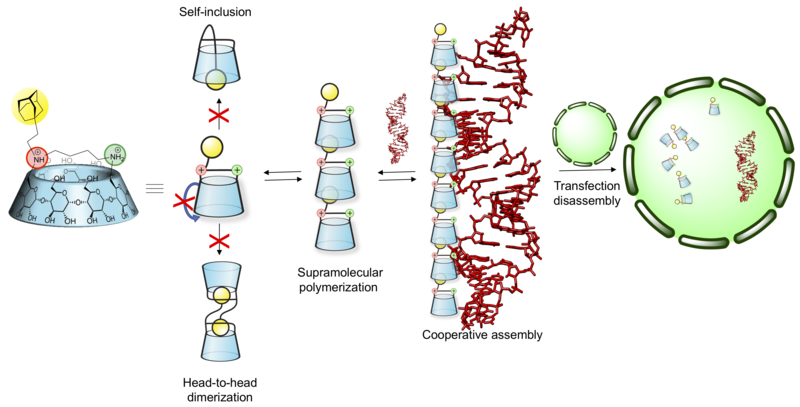 Furthermore, the self-assembling cyclodextrin derivative interacts in a highly cooperative manner with DNA as demonstrated by compaction experiments. It also interacts cooperatively with siRNA and allows its transfection. NHC-capped cyclodextrin ligands, derived from alpha- and beta-cyclodextrins give opposite regioselectivities in a copper-catalyzed hydroboration. This results from two different mechanisms : the conventional “parallel” one and a new “orthogonal” mechanism. The shape of the cavity was shown to induce both a regioselectivity and a mechanistic switch. The scope of interest of the encapsulation of a reactive center is therefore broadened by this study. A series of capped metallo-cyclodextrins were synthesized, affording a variety of artificial chiral metallo-pockets through modulation of the space around the metal. Carbene ligands were used as caps to place a silver, gold or copper center at a well-defined location inside the cyclodextrin cavity. Multiple weak interactions involving the d10 metal center and intra-cavity hydrogen atoms, including anagostic interactions, were observed in solution. 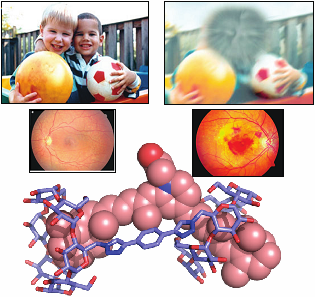 Thus, the metal was used as a probe to assess intra-cavity metal–H distances to build 3D models revealing the very different shapes of capped alpha-, beta- and gamma-cyclodextrins and the unprecedented helical shape of the chiral pocket of some modified cyclodextrins. This series of NHC-based cyclodextrins were compared in gold-catalyzed cycloisomerization reactions for which the 3D models were used to rationalize the observed regio- and stereoselectivities. Endo-α-1,2-mannosidases and endo-α-1,2-mannanases, members of glycoside hydrolase family 99 (GH99), are interesting targets for inhibitor development as they play key roles in N-glycan maturation and microbiotal yeast mannan degradation, respectively. These enzymes are proposed to act via an original 1,2-anhydrosugar “epoxide” mechanism that proceeds through an unusual conformational itinerary. We have studied the synthesis of neutral dideoxy, glucal and cyclohexenyl disaccharide inhibitors, their binding to GH99 endo-α-1,2-mannanases, and their structural analysis by X-ray crystallography. DFT calculations of the free energy landscapes reveal how the neutral inhibitors provide shape but not charge mimicry of the proposed intermediate and transition state structures. 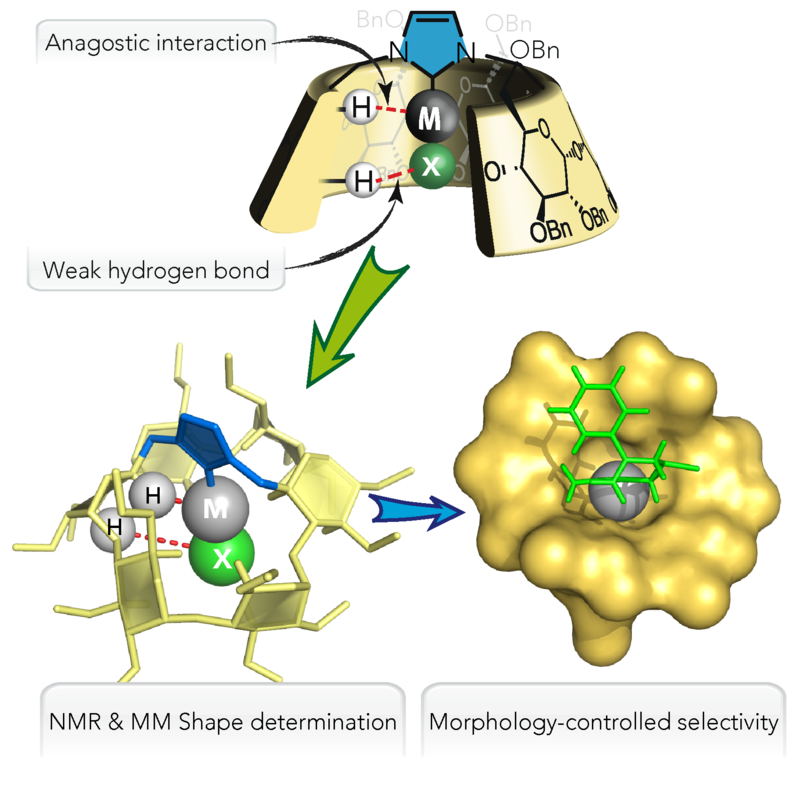 This work reveals how shape and charge mimicry of transition state features can enable the rational design of potent inhibitors. Site-selective modification of symmetrical concave molecules is a highly challenging task due to the rapid increase in potential combinations as the number of sites increases. There are 7826 ways to arrange 6 beads of 6 colours on a necklace. 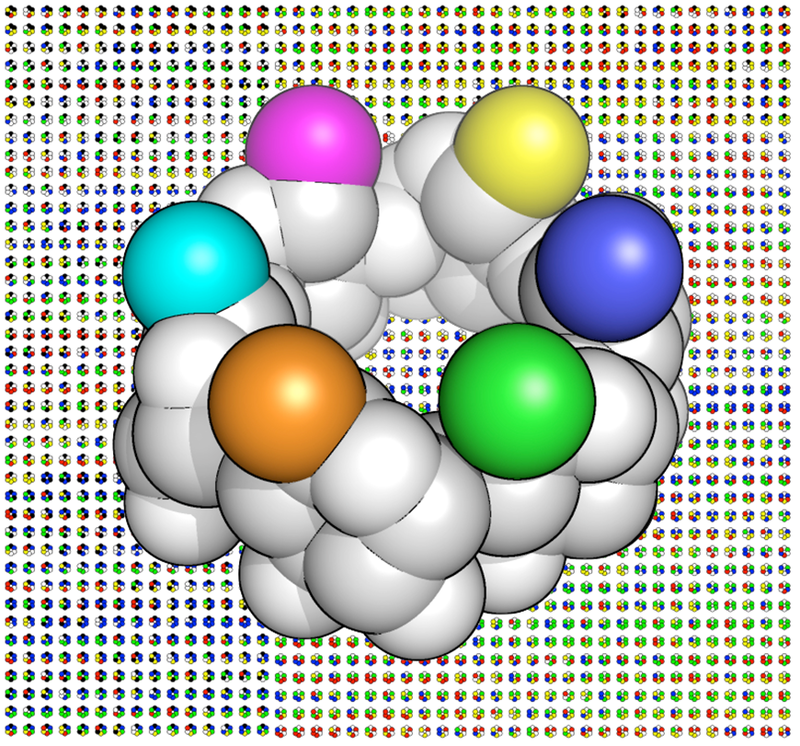 Part of those arrangements form the background of this picture, on the forefront of which a single cyclodextrin with 6 different colours is represented. We have delineated routes to selectively functionalise six symmetrical positions, leading to a hexa-differentiated α-cyclodextrin. The combination of chemical synthesis, NMR, and calculations show that it is possible to restore the anomeric effect for an acetal when replacing one of the oxygen atoms by a CF2 group. This result provides key findings in chemical sciences as it strongly suggests the importance of the stereoelectronic component for the anomeric effect. Moreover, the ability to artificially mimick the natural glycoside conformation may open new avenues for sugar-based drug design. The crystallization of a di-azido-α-cyclodextrin has revealed a polymeric self-assembly involving a rich variety of azido-type interactions. The crystal cohesion relies on the cooperativity of a primary azido inclusion, a secondary azido-azido interaction involving an unprecedented tautomeric distribution and a tertiary azido-groove interaction. 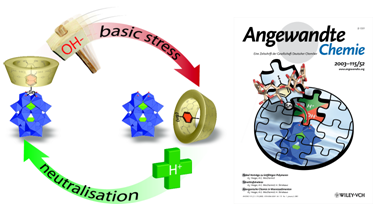 The second azido group brings a major contribution to the supramolecular structure illustrating the benefit of a difunctionalization for the generation of hierarchy. A cyclodextrin capped with a N-heterocyclic carbene allows the entrapping of a metal right in the middle of its cavity. This position induces an original set of interactions including C-H…M, C-H…X and X…π. The latter permits the closing of the cavity, which is commutable by ligand exchange. The metal appears to be very deeply buried, so as to be insulated from an electrode, but it retains activity as a catalyst. Furthermore, the cavity has an influence both on the regiochemical and the stereochemical outcome of the catalysed reactions. When diametrically opposed regioselective debenzylation is frustrated, an unexpected double debenzylation reaction affords original tetrafunctionalized cyclodextrins in a controlled and efficient manner. An auto-healing process of the first host–guest complex involving a polyoxometalate hybrid and a cyclodextrin was uncovered. Indeed, this inclusion complex allows the complete restoration of the anchored organic moiety released by a basic stress, a process otherwise not fully reversible. Cyclodextrin-based tetraphosphine called α-Cytep glycocatalyst induces up to 340 000 000 000 TONs and 1 000 000 000 h-1 TOFs in Suzuki-Miyaura couplings. Regioselective twofold deprotection of benzylated cyclodextrins with diisobutylaluminum hydride affords products that can behave as enantiomers. For example, they can act as ligands for enantioselective Pd0-catalyzed reactions and their complexes display opposite circular dichroism signals (see picture). They can thus be seen as being inherently chiral cycle surrogates.